Connie poses with her award winning design at the 2007 Canada Blooms. 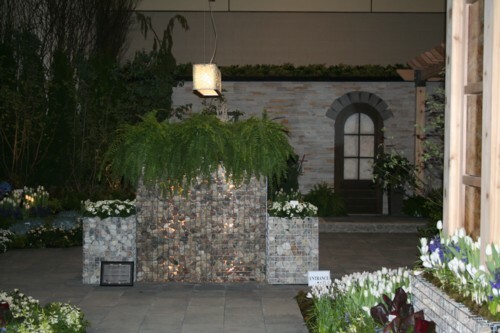 Her feature garden at Canada Blooms won 2 awards: The S.G. Ulbright Award for “Outstanding Medium Size Garden” and the Certified Landscape Designer Award. 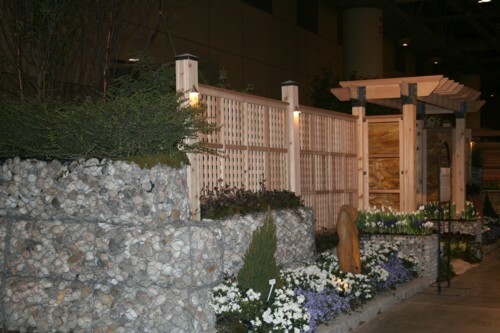 Entrance to the 2007 feature garden where the stone wall and planters were a hit. Wire baskets (gabions) were used as retaining walls. Blue chips campagnula and white azaleas lined the front planting bed. Rustic arches framed the entrance to the garden.